Bryson City basket weaver Debra Mills fashions one of her favorite designs, a ‘cat head’ basket; so named because, when turned upside down, the reed basket’s pointed corners resemble cat’s ears. 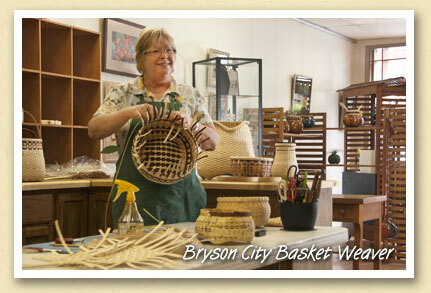 Inspired by an old Ozark oak egg basket that belonged to her husband’s grandmother, Debra began weaving baskets in 1990. While mostly self-taught, she’s learned some of her techniques from other talented professionals through classes and workshops. And now, she’s passing that knowledge on through her own classes at Studio 19, the working studio and gallery she shares with three other artisans in downtown Bryson City. Debra offers beginner and refresher courses for families and small groups. For more information, call 828-736-1605. Studio 19’s other artisans are corn shuck artist Lori Anderson; functional gourd artist Joan Glover; and metal clay jewelry designer Jules Bottorf. All offer classes in their craft.